Plaster has been around for a long time now. It was commonly used in homes a very long time back. Some say that plaster was used as far as in the 1950s. May people like it then as it was easily made, which made it popular, cheap and easy to find. Even now, there are even more people who just love to have plaster in their homes. Plaster is manufactured from gypsum, water and sand. Plaster is used and considered important to make walls, ceilings and many more architectural features. Nowadays, drywall seems to have taken plaster\’s place as a drywall is considered more durable than a plaster wall. Many prefer the makeover from plaster wall to drywall as they feel it gives their home a whole new different look as compared to having the same type of plaster wall. It is most likely that your interior walls are made from plaster if you own an old home or any home that is at least 80 years old. Although the plaster walls are far more beautiful and durable than the modern drywall walls, sometimes you have to replace it with a new drywall. Here are the steps on how to do it. 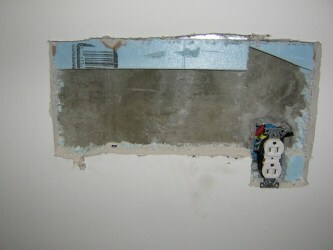 First, rip out the plaster by chipping away all of the old plasters from the walls. This will create a flat surface to attach the drywall. Remove the plaster, leaving the lath and pay more attention to the corners where it is more difficult to remove the plasters. You should be down to the bare wood lath when you are finished ripping out the plaster. Then, prepare the surface by hammering in or removing any old nails, screws, staples or anything else that holds onto the surface of the lath. The drywall will lay better once installed on the flat lath surface. Use the drywall screws to hang the new wallboard. Start with the ceiling first if you are hanging a new ceiling as well as new walls. Next, do the first 4 feet from the floor, followed by fitting in the pieces between the floor pieces and the ceiling. Be careful when hanging the drywall to ensure the seams lay flat against each other. This will make the mudding easier. Stagger the pieces like a bricklayer so that you don\’t have seams running straight from the floor to the ceiling as you go up the wall. Apply drywall mud to all of the seams and covering them with drywall tape. Allow your mud and tape to dry, smoothing the seams with finishing mud. Extend the smooth-mud surface out about a foot on each side of a seam as smooth as you can. Fix any blemishes and allow the mud to dry thoroughly for at least 24 hours. Finally, sand the edges of the mud and any uneven parts of the mud before painting. This will make the entire wall and seam look more polished and smooth in appearance. This entry was posted in Home Improvement on August 24, 2010 by Mike.